VN: Absolutely! We could not have asked for more. We had to be there for Vedam chanting early in the morning by 5.20 and after that we had to be in Poornachandra Auditorium by 8 a.m. because Swami would come there. Where was the time for us to do 4–5 hours of parayanam? So we used to get up every morning around 1.30 and take bath. BP: You were no less than those pundits. VN: Since Swami did the initiation, we wanted to do it with all our vigour. One incident I want to share about the last day of the first Parayanam. That day the Poornahuthi was to happen only around 9.30 or 10 a.m. and Vedam boys were supposed to lead the procession. Since there was enough time, I thought after early morning Vedam I would do the Parayanam. I went and sat in the old hostel where the Brindavan boys currently stay whenever they are in Prasanthi. It is directly opposite the mandir; the balcony there directly faces Swami's Prasanthi Nilayam mandir. I think devotees will be able to picturise what I'm talking about. BP: Yes. Sai Kulwant Hall didn't exist then. VN: I had completed my Parayanam and I was doing the Aparadha Kshama Stotram. I completed the last line and then bent down and did Namaskar praying, “Swami please forgive me. We are all innocent children but we love to do something for you. I know that there can be shortcomings.” The moment I lifted my head what I saw was amazing. Swami was standing in the balcony in the mandir! Nobody else had seen Him. He signalled and called me. Initially my instinct was to jump directly from the terrace and run but I didn't do that. I ran through the steps and went to Swami. He was in full smiles and said, “Go and get ready. Call all the Vedam boys for the procession.” Of course this was only incidental but the thing to note is how He called me at the last moment. Like this so many times He has blessed me. VN: Yes. In fact I did the Devi Mahatmya Parayanam for so many things. Once I wanted to go for Trayee Brindavan opening but without Swami's permission we could never go. I didn't want to miss the golden opportunity. We didn't know what to do and so I sat with Devi Mahatmyam and started praying, “Swami, please call us.” Swami did send word to Kutumba Rao to send two of us for the opening of Trayee Brindavan. Like this He responds. BP: I think the power of these mantras is amazing. SS: Yes but then we tell the boys every time that Devi Mahatmyam is not to be used as a means to clear examinations. VN: But Shashank, in the initial stage unless they have something, they will not be convinced. Once they experience, they get convinced that they can use it for a higher purpose. SS: Yes. We always tell Sir's story and his experiences of how Devi Mahatmyam is a sure-shot arrow to success if you really want to achieve something. SK: The students don't pray for any specific thing but it still happens. BP: The very fact that so many boys are coming forward enthusiastically to do this shows that they are getting something out of it. SS: Yes. It's very demanding because they have to get up early in the morning, have bath, and sit for 4–5 hours. Some of them opt to go for Grama Seva but some of them don't and based on that there's a slight modification in what they read. There are food restrictions too; you can eat only certain satwic foods. Also you cannot go to the washroom during the Devi Mahatmya Parayanam and you have to sit and read it for 4–5 hours. VN: Tell me Shashank in today's world and the scenario of the youth, can you imagine them doing this when they could have happily gone and spent 5 hours in clubs? BP: Even the attention span of 5 hours to do something like this is a lot in today's times of Facebook and Twitter. SK: Let's also not forget that this is a foreign language for them. They don't understand Sanskrit but they are reading for 5 hours without knowing anything. Their sole conviction is that they are doing it with a positive approach and for the welfare of humanity. They are a part of this in Swami's direct presence and a part of the yagna itself. It's a great motivation for them. But as Sir said in today's times elsewhere if you mention this, people will say that these boys have all gone mad. VN: But this madness helps! SS: Ultimately all the students have one thing in mind — they want to please Swami. That is the greatest aim. BP: Just like Swami used to go to any extent for the students and even now does in His own mysterious ways. This relationship between Swami and the students has always existed. VN: When Swami was there, the motivation was high but I thought that in coming years the number will dwindle. I was rather surprised to hear from Shashank that this year there are 59 boys. SS: We ourselves are surprised. Our warden usually tells the boys, “If you have done Devi Parayanam one year the next year you should do Grama Seva, so that you have both the experiences” because some of them are only post-graduate students for two years. But the students literally fight saying they don't want to go for Grama Seva but want to do only Devi Mahatmya Parayanam. That is the type of experience they have. It's something very unusual to imagine in the current times. BP: As Shivakumar Sir was saying, some boys do both. SS: Yes. It's a lot of motivation. 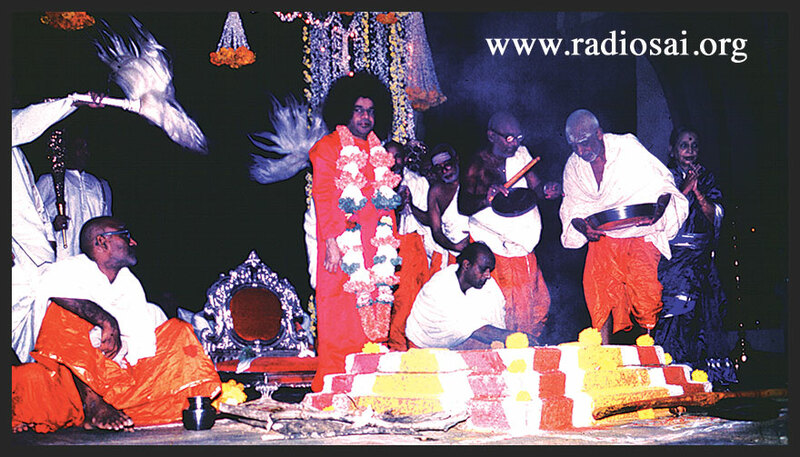 To continue, Swami used to come and after finishing with the pujaris on stage who were mainly a part of the Rudra Homam He used to come to the Devi Mahatmyam group. I used to be sitting there with the boys because I also did for 8 continuous years. 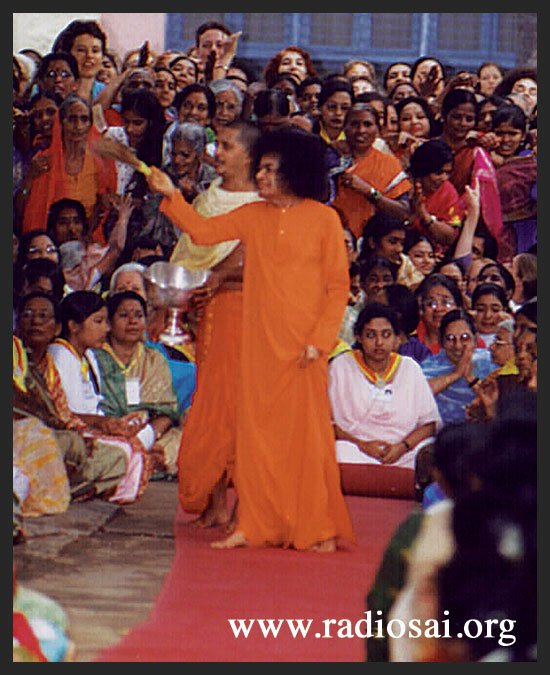 Swami used to come there and not just sprinkle water but sometimes bathe us in the water from the kalasham. My face, hair, etc. would be dripping and boys would later say, “Brother, what did you do? Did you have bath on the stage?” I would say, “No Swami gave me a bath with the broom which was used for the yagnam!” What is it called, Sir? SS: Yes. Those were memorable times. BP: I think that was the most looked-forward-to event in the Dasara at least after I become a student. You wait for the last moment and try to sit in vantage positions on the last day so that when Bhagawan sprinkles the water it will fall on you. VN: In those days Swami used to go outside the Poornachandra Auditorium. The crowd used to be so much and He used to sprinkle on everyone. Last year I remember in the physical absence of Swami they asked some of us to take the water and sprinkle it on devotees. Within 5 minutes I had severe cramps on my right hand. Just imagine Swami alone doing this for the whole of humanity! How much of physical strain He would have undergone. I might feel bad if a drop doesn't fall on me but imagine Swami having to satisfy so many devotees! It used to take one and a half hours. SS: Sometimes the Poornachandra Auditorium used to overflow and so He used to keep this ceremony for the evening and do it in Kulwant Hall. The size of Kulwant Hall is double that of Poornachandra Auditorium and so it would take that much longer. I still remember the last time Swami physically did it was for Dasara of 2002. I was in first year MBA then. Swami went around the whole hall and He saw that many parts of the hall had not been covered. So He went a second time sprinkling water on everybody. He took two rounds with the vessel being held by the main priest and He used the Darbha grass to sprinkle water. 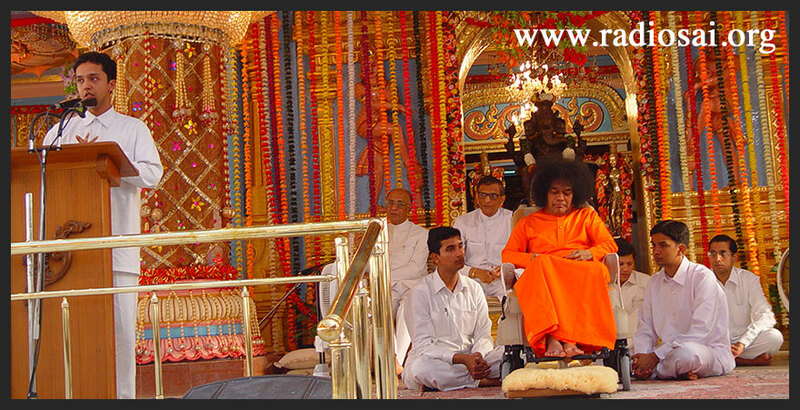 VN: Swami's life is for others. Total sacrifice! That was yagnam from His side. SK: I remember in 1978 I had come as an 11-year-old. One of the highlights of the Poornahuthi day was the Vibhuti Abhishekham of Shirdi Baba. 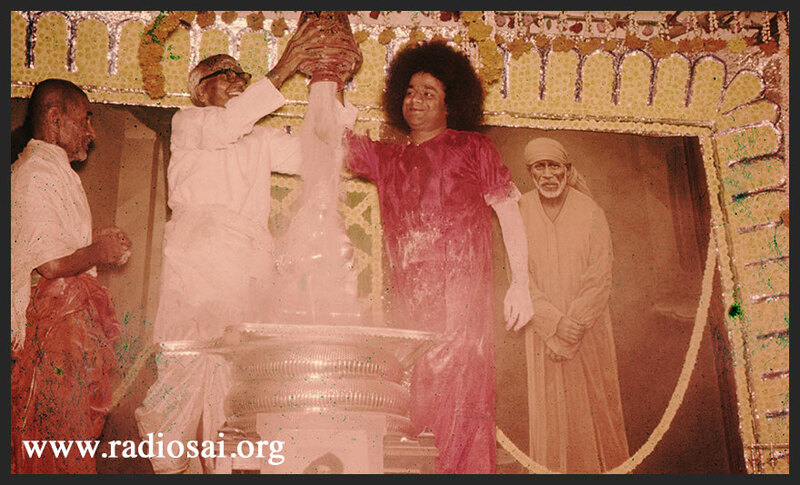 After the Poornahuthi the Shirdi Baba statue was kept and Prof. Kasturi held the vessel. Swami came and just rotated His hand and Vibhuti fell on Shirdi Baba. The very interesting thing is when Swami removed one hand, for those few moments the Vibhuti shower stopped and again when Swami put His other hand it restarted. BP: We have seen the video; it is fantastic. SK: I have personally seen it; it was wonderful. BP: A stone got stuck to metal. SK: I have another nice incident connected with Dasara. As I was just mentioning, when Swami used to remove His hand the Vibhuti shower used to stop. I have witnessed a similar incident in 1989 when there was no Sai Kulwant Hall and students used to be seated in the sands. When it rained all of us used to rush and sit as close as possible to the interview room so that we would not get wet. The next moment it totally stopped raining. Even scientifically I had been thinking that if the rain had started from such big clouds it must come and fall. But it didn't fall. It just stopped. This was a miracle for just a few seconds. Then when Swami again said, “Start” it started raining. Just like how the Vibhuti shower used to stop when He removed the hand from the vessel and how it used to start when He again put the other hand. These are all Swami's mahimas and we have to just enjoy every moment. SS: This Shirdi Baba idol is the one which is in the bhajan hall. It's in the sanctum sanctorum of the Prasanthi Nilayam mandir. VN: I think it was given by Mr. Ratan Singh. BP: There are so many anecdotes and we will never be done even if we go on for another hour or two but I thank you all for going down memory lane and sharing these precious gems of Dasara celebrations from yesteryears. I know there is a lot more that is locked up in your hearts and we definitely need to meet again. But let me ask you this Veda Narayan Sir. What has been your cherished moment and what is it that inspires you every Dasara celebration? What is your personal take-away from this celebration? VN: Certain visions that Swami gave me during Dasara which I have not shared with anyone. I always looked up to Swami as my mother and He has fulfilled that role. There are certain things too personal which He has showed me on stage during Vijayadasami. That is why I always look forward to Dasara. I have a real soft corner for the divine mother and I think of Swami and address Him as my mother. BP: He has given you experiences confirming that and that is what really connects you so much to Dasara. VN: Yes. That love is something great. Like a mother He has corrected me in my life and has always been loving and forgiving. BP: Beautiful! Shivakumar Sir, your cherished moments of Dasara? What inspires you the moment Dasara is mentioned? SK: It's a very simple thing but it is the amount of interest that Swami has taken. Since we chant for a very long time I generally take some lavang (clove) and keep chewing it so that the throat is soothed. I keep munching it slowly so that it becomes comfortable. 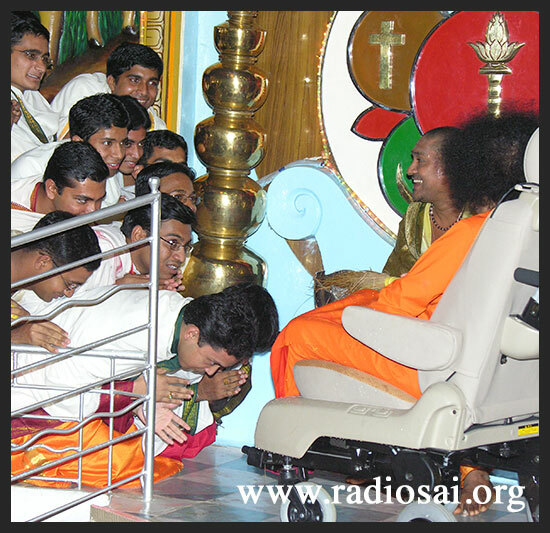 On one occasion possibly 5-6 years back, Swami was being wheeled on to the stage and I was chanting Vedam there. When Swami came near me I could make out that He was mumbling something. Very intently I tried to listen to what He was saying. He was commenting in Telugu seeing me, “Yemo thintunnaadu (He is munching something).” These are small things but He shows so much love. The amount of love that Swami has showered on all of us is something we can never repay. We are totally grateful to Swami. BP: Shashank, personally what does Dasara mean to you? SS: Personally what I feel about Dasara in Prasanthi Nilayam is that it's an opportunity Swami has used to put forth the glory of the rich Indian culture before students and devotees. I come from a metropolitan city like Bombay where religion, spirituality, etc. are something unfashionable and orthodox for many. There are many genuine devotees and seekers there but by and large that's not the case. If not for such a celebration we'd have never had the opportunity of seeing the glory of Indian culture. On such occasions we realise how significant and how exalted our Indian culture is because there is a science behind the science, there is logic behind the logic, there is deep spirituality behind every ritual and each of this is shown in action. Swami Himself supervised each of these activities and gave students an opportunity to participate. After having participated they realise the satisfaction and the joy they derive. They are convinced for life that what Swami has said and what they have done and experienced is definitely true. With that they go out as true messengers of this great culture and the samskriti which Swami always wanted to impart through His University and educational systems. He has used Dasara as a very important tool for that. Of course I've had the opportunity to speak in front of Swami on many occasions and one point I always used to say is that during Dasara we get to see three things in Prasanthi Nilayam: Karma (Action), Upasana (worship) and Gnana (knowledge), all three pathways to God. Karma is in the form of Grama Seva or Narayan Seva. Upasana is in the form of the Yagnam and the rituals. 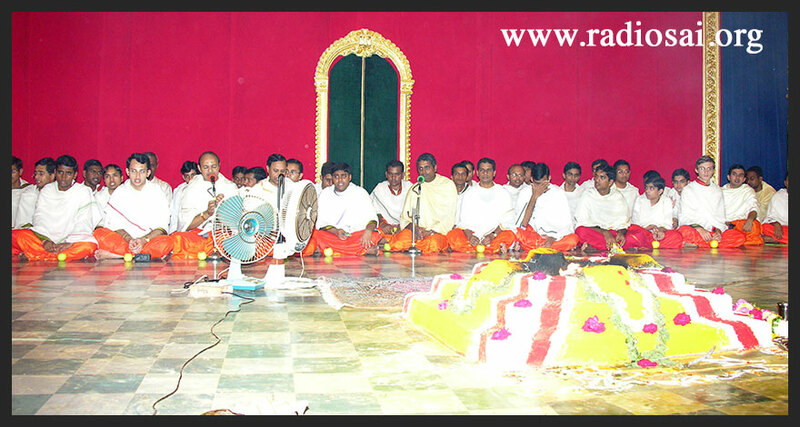 Gnana is through the Prasanthi Vidwan Maha Sabha and Swami's discourses and talks by devotees and students. All the facets of our pathways to God are in action. You can select your pick and then start working on that and you are sure to reach your goal through the way that interests you. SK:Karma, Upasana and Gnana is what SAI stands for: Service, Adoration, and Illumination. BP: Lovely! Swami has very beautifully integrated all this into the curriculum of the students and so by the time the students leave the portals they get such a beautiful perspective of not only their secular education but more importantly the holistic education. In 1992 Dasara when Swami was explaining the inner significance of the festival, He said that we worship the three goddesses Durga, Lakshmi and Saraswati. We worship the Devi to attain Ichcha Shakthi or willpower and this is so important because it is the source of several other potencies like intellectual power and discriminating power. To develop all these you need willpower. He added that to gain willpower we have to cultivate vairagya or detachment. How do we cultivate Vairagya? Swami said that if one has the habit of taking hard drinks, he should give up some of them to begin with and slowly he will develop the mental power to give up all the other habits. So the power to give up worldly feelings and cultivate Godly feelings develops when we do these rituals and worship Devi. The mantras enable us to develop willpower. When I read this I felt this should be our prayer too. Let us also pray to the Lord that as we carry on in this world and experience whatever is happening outside of us, let us also take every opportunity to purify ourselves inside. With every activity let us clean and clear our inner consciousness so that we can see the reflection of the Divine bright and clear and hear His voice loud and sweet within and deep inside. Let us cherish and relish this love. Let it grow and let it guide us to lighten and brighten not only our lives but the lives of everyone we come in touch with as every single morning of our sojourn on this earth arrives, because ultimately if there is one experience that is the common destination for all it is the experience of oneness. Deep inside we are all one and we must pray to Bhagawan that we not only know this as an intellectual concept and idea, but feel and experience this as a genuine and soulful way of leading our lives. With this prayer, let us conclude this panel discussion. I thank all three of you, Veda Narayan Sir, Brother Shashank and Dr. Shivakumar for being here.